A PhysicalWind class is used to simulate a box-shaped area inside of which the wind is blowing. The wind gradually decreases up to the box boundaries. 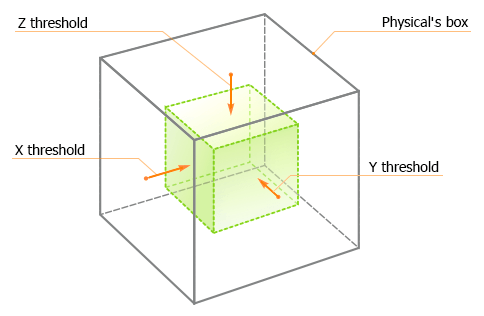 A cloth body or a rigid body must be assigned to the object. If the rigid body is used, a shape should be also assigned. Casts a PhysicalWind out of the Node instance. Sets a value indicating how much the angular velocity of the objects decreases when they get inside the wind node. Returns the current value indicating how much the angular velocity of the objects decreases when they get inside the physical wind node. Sets a value indicating how much the linear velocity of the objects decreases when they get inside the wind node. Returns the current value indicating how much the linear velocity of the objects decreases when they get inside the wind node. Sets the size of the physical wind node. Returns the current size of the physical wind node. Sets the threshold distance values along the coordinates axes relative to the wind node size (that is, inside of it). Returns the current threshold distance values along the coordinates axes relative to the wind node size (that is, inside of it). Sets the velocity of the physical wind flow along the axes. Returns the current velocity of the physical wind flow along the axes. Constructor. Creates a physical wind node of the specified size. const Math::vec3 & size - Wind box size in units. Casts a PhysicalWind out of the Physical instance. float damping - Angular damping value. If a negative value is provided, 0 will be used instead. Wind box size in units. Sets the threshold distance values along the coordinates axes relative to the wind node size (that is, inside of it). It determines the area of gradual change from zero to full wind velocity. const Math::vec3 & threshold - Threshold distance in units. Returns the current threshold distance values along the coordinates axes relative to the wind node size (that is, inside of it). It determines the area of gradual change from zero to full wind velocity. See also setThreshold().